Zhangjiakou is a famous city north of the Great Wall, 180 km to Beijing in the north and 280 km to Tianjin. 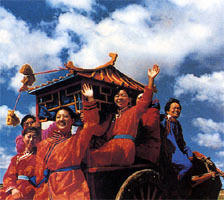 Its unique tourist resources mainly consist of the magnificent Great Wall, scenic grasslands and the three ancestors' culture of Yan Di, Huang Di and Chiyou. The Yellow Emperor City in Zhuolu is the oldest capital of China. The historical site of the ancient battlefield in Zhuolu, the site where the Yellow Emperor fed horses with water, the Yellow Emperor Spring, Chiyou Village and Chiyou Tomb, and the Three Ancestors' Hall to Yan Di, and Yellow Emperor and Chiyou are the ideal places for domestic and foreign Chinese to look for their roots, offer sacrifices to the ancestors and understand the ancient culture. The Jindianchuan Grassland in Guyuan, Zhongdu Grassland in Zhangbei, and Chongli International Skiing Base are tourist attractions for sightseeing, spending a holiday at a summer resort and skiing in winter.